3. 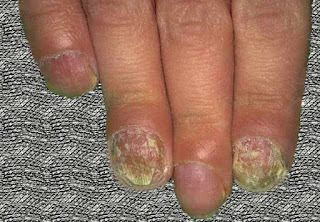 Proximal white subungual onychomycosis occurs when the organism, generally T. rubrum, enters the nail through the proximal nail fold, producing yellow-white portions of the under surface of the nail plate. The surface of the nail is unaffected. This occurs almost exclusively in immunocompromised patients and is a well-recognized manifestation of AIDS. 4. Candidal onychomycosis involves the entire nail plate in patients with chronic mucocutaneous candidiasis. It is also commonly seen in patients with AIDS. 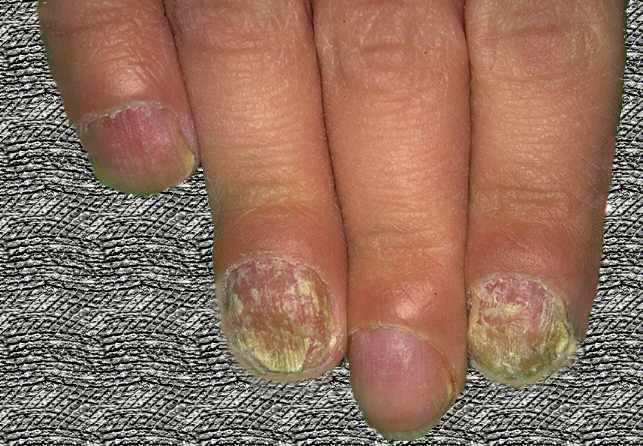 The organism, generally Candida albicans, enters distally or along the lateral nail folds, rapidly involves the entire thickness of the nail plate, and produces thickening, crumbling, and deformity of the plate. Topical azole antifungal agents may be sufficient for treatment of candidal onychomycosis in an immunocompetent host, but oral antifungal agents are necessary for treatment of those with immune deficiencies. Nice information and very concise way to give useful info. You can also find this website www.pgmedexam.com for medical related information.